I am interested in this property listing that you have published in naxosrealestate.com. Please provide me with more information. Thank you! Don't have an account? Click on the button below to register. 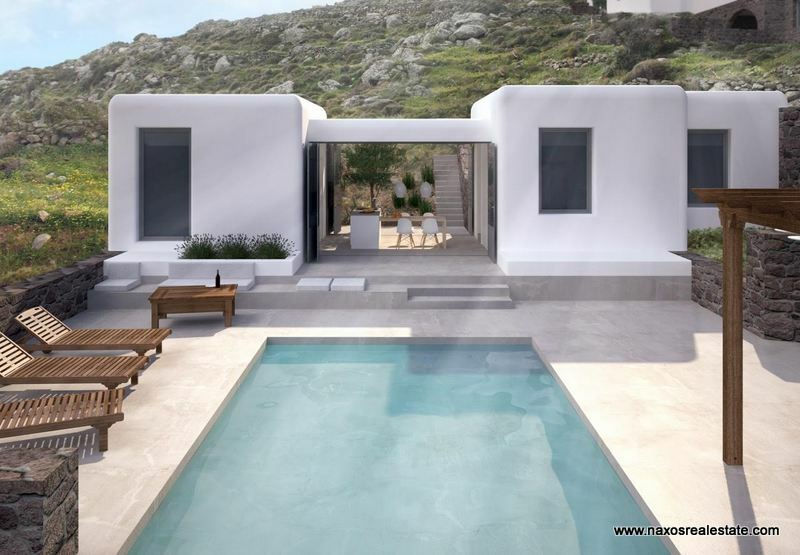 Naxos Plaka, THREE MODERN STYLE villas, each with 3 bedrooms and 2 bathrooms. A winning project in architectural competition organized by our company in collaboration with the University of Athens. The houses will be built on a big plot of land of 9.000 sq.m. on the hills above Plaka beach, assuring a perfect view to the fields, the rocks, Naxos town and the sea! House (1) 100m2 - 325.000 euro SOLD!!! House (2) 100m2 - 340.000 euro SOLD!!! House (3) 110m2 - 350.000 euro SOLD!!! A Plaka, Naxos TROIS villas de STYLE CONTEMPORAIN chacune avec 3 chambres et 2 sdb. Il s'agit d'un projet gagnant d'un concours d'architecture organisé par notre société en collaboration avec l'Université d'Athènes. Les maisons vont être construites sur un terrain de 9.000 m² sur les collines en dessus de la plage de Plaka offrant des vues sublimes sur les champs, les rochers, la ville de Naxos et la mer! Maison (1) 100m2 - 325.000 euro VENDU !!! Maison (2) 100m2 - 340.000 euro VENDU !!! Maison (3) 110m2 - 350.000 euro VENDU !!! Naxos Real Estate has been active for over 13 years on the island of Naxos. The owners of the company, Mr Veronis Giorgos And Mr Lagogiannis Manolis with their experience on the real estate market, the right service, the professional integrity and transparency is renowned in the real estate market of Naxos island, Greece.